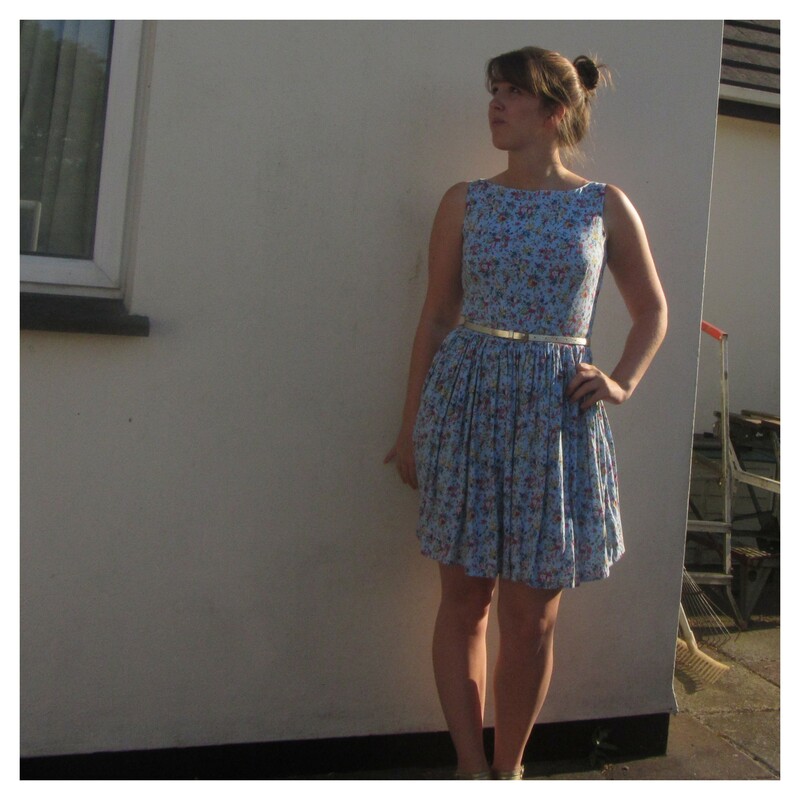 The second 2444 dress started off as a self drafted hack, using the original bodice back (but with a slightly lowered neckline and narrower straps) and changing the front to a draped/pleated faux wrap. I really thought it would work and perhaps if I’d had more patience it would of eventually, but I wasn’t feeling the trial-and-error-ness, so I re-cut the front to the original pattern just with narrower straps and a slightly lower neckline. The outer fabric is a viscose I originally saw at Trago Mills last summer but didn’t purchase as I was having some dilemma about fabric stashing, and then regretted it as when I went back they’d sold out. But then, fast forward to a trip to Birmingham Rag Market at the end of March this year, and I found the exact fabric at £2.50/m, plus 25cm free as I finished the bolt. I’ve seen it in a different colourway on the Regency Rags Ebay store for £2.99/m and also on myfabrics.co.uk at a wayyyyy higher price. The lining is a polyester crepe du chine from the Remnant House in Bude, also for £2.50/m. Both of the fabrics had the potential to be a pain to cut out and sew, so I liberally doused them in spray starch first, and it was sooooo much easier. I added a waistband just because I like them, and made the skirt of two very gathered rectangles. I wasn’t sure how long I wanted it, so had to cut the skirt bottom once the dress was assembled and it was horrible. I want to say the hem only looks wonky in the photos, but the reality is, I’m pretty sure it’s wonky in real life. As I’d only bought 1 metre of the lining, and had already cut out the wrap bodice front in it, I had to do some creative piecing when I changed plans, but it worked out fine, and actually gave me some ideas for some intentional piecing on future dresses. I decided to use a scrap of (totally unmatching) polycotton for the inner waistband just to give it a bit more structure. The lining skirt is another pair of pleated rectangles using as much of the left over fabric as possible. I changed the zipper to the side, and hand sewed the lining to it after machine sewing the outer fabric, and added a hook and eye at the top. Due to my messing around with the pattern, I’m not really sure what size this dress ended up; it fits better than the peplum, but there’s still a lot of bagginess above the chest (not surprising seeing as I didn’t do anything to fix it). EDIT: I took the photos after it’d been washed (even though I prewashed both fabrics) and the chest bagginess seems to have disappeared, yay! But it’s really swirly and pretty, and I can pretend like the less full skirt lining makes it safer for windy days. I think it would have been dressy enough to wear to the wedding (and actually I think I should have worn it) but in the end I was swayed by the third version’s dressy-ness as I knew this dress would get worn lots anyway.